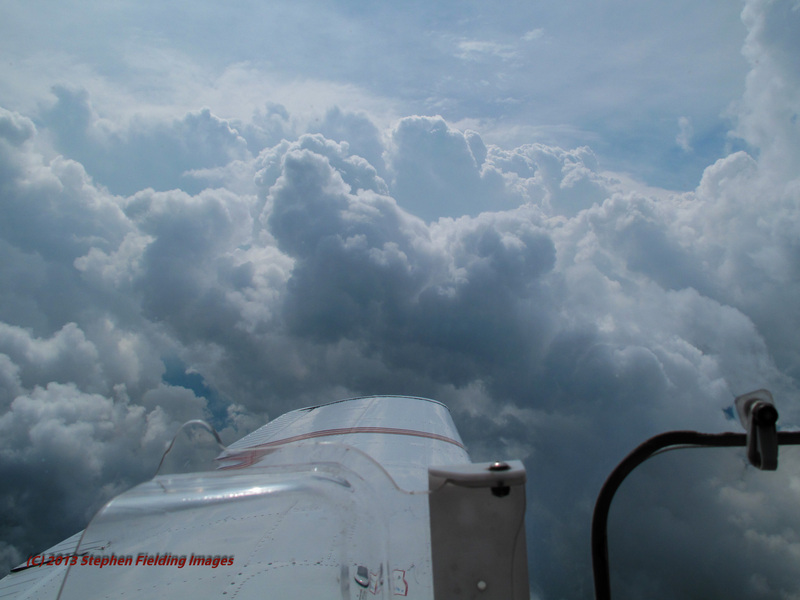 I recently revisited some of my older photos and came across some shots taken from the cockpit of our Piper Arrow during a return flight from Connecticut to Rochester, NY in August 2009. I think these photos are appropriate for this blog since weather is certainly a major component of the natural environment. This trip found us on an instrument flight plan (permitting properly certified pilots and aircraft to fly inside the clouds) at 10,000 feet. The forecast called for the threat of scattered thunderstorms just to the south of our route, so we decided to launch and remain north of that activity. However, any pilot worth his salt knows that you want to treat forecasts as something possible–not probable. In other words–always have an out. Things were going pretty well for most of the trip. We were well on top of the cloud deck, and most of the build-ups (containing turbulence and the precursors of thunderstorms) were indeed to our south. However, as we neared Syracuse the build-ups were not only continuing to tower upwards, but they were moving north, threatening our route to Rochester. 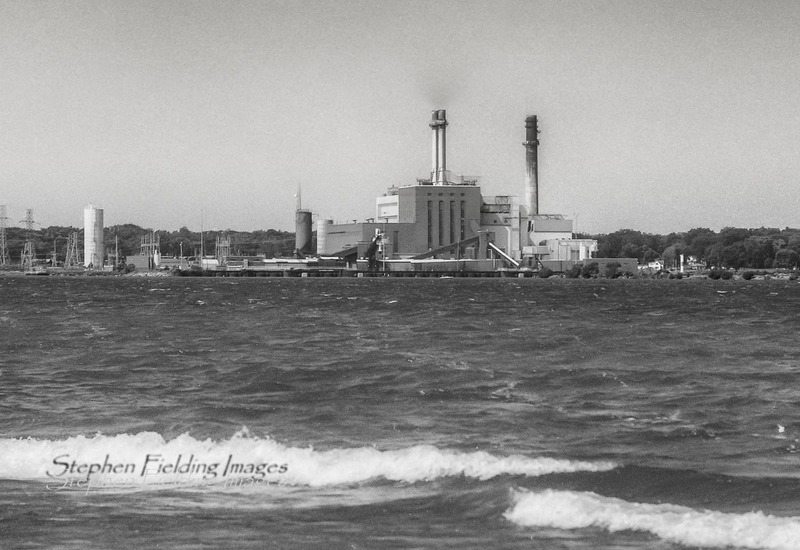 You can see what we saw in the photo on the left. It was abundantly clear that it was time to disregard “get thereitis” and ask ATC (air traffic control) for an alternate airport. ATC advised that weather was clear to the north at the not too distant Griffith Field. We asked for headings and landed without incident, as did at least one other pilot on his way to Philadelphia. We monitored weather from the ground as we sat around discussing weather with other pilots. 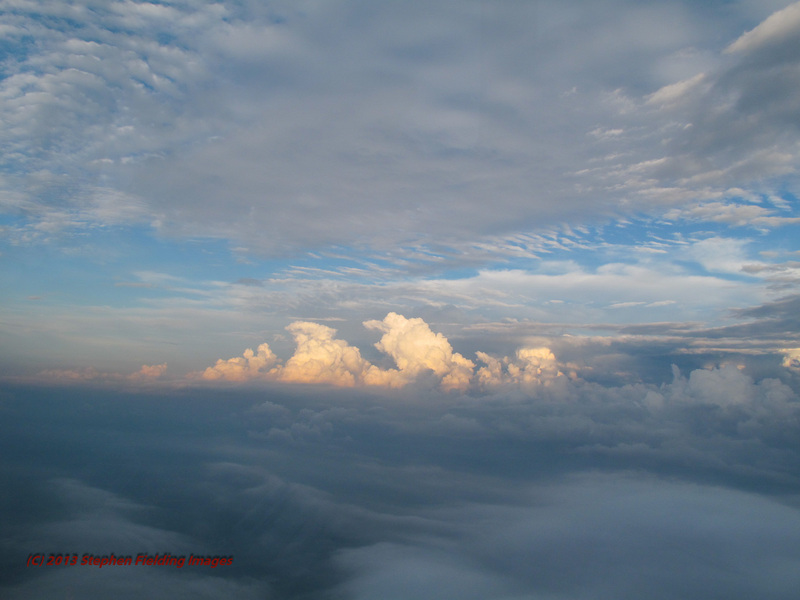 As things began to clear late in the day we resumed our flight. Though the atmosphere was still hot, as you can see in the following photographs, the build-ups were dissipating and most of the clouds were well southeast of our route. The flight was smooth and we arrived at Rochester around 9:00 PM, several hours later than planned. Pilots, like drivers, often feel a compulsion to push on and hold to the original plan. Unfortunately, this proves fatal in many cases, since planes can be ripped apart in moderate and heavy turbulence, or pilots become disoriented thus losing their ability to interpret their gyroscopic instruments (i.e., they are no longer able to keep the plane flying straight and level). 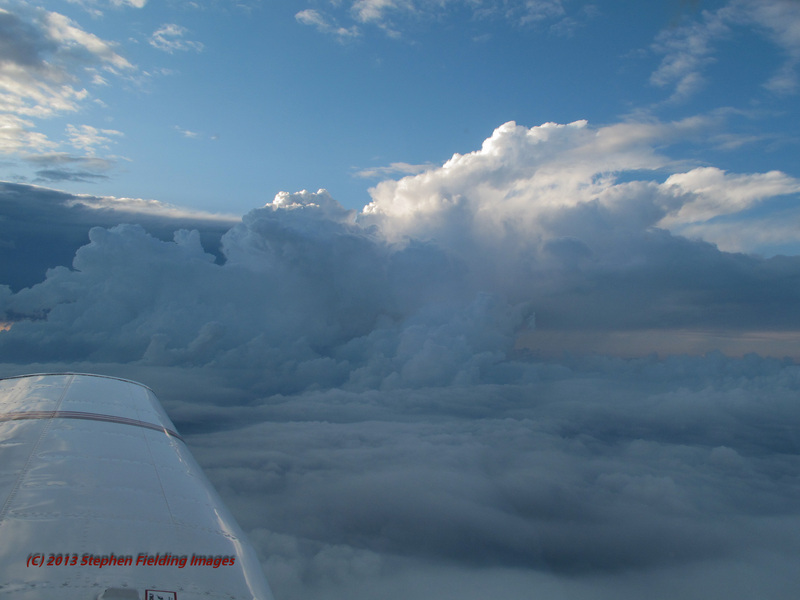 The next day we learned that intense thunderstorms were accompanied with one-inch hail that battered crops around Syracuse–my decision to fly to an alternate was vindicated! Given the effects of global warming, thunderstorms are becoming more numerous and intense–posing ever greater threats to aviation (and those on the ground). The next time your flight is delayed, due to thunderstorms, be sure to thank your pilots for using good judgement.